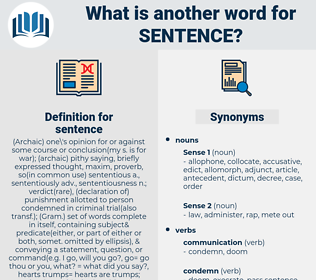 What is another word for sentence? indictment, offence, sense, word, remark, sorrow, pain, subparagraph, shame, grief, detention. serving, Bothering, threatening, declining, Cultivating, trying, Having, going, Doing. Sentenced, Penalties, punishment, Punishments, phrase, phrases, judgements, condemnation, imprisonment, Judgments. Sentenced, punishment, imposition, clause, incarceration, phrase, adjudication, prayer, trial, expression, condemnation, confinement, wording, pity, imprisonment, knell, prosecution. charge, encouragement, reward, accusation, indecision. applaud, justify, approve, praise, absolve, acquit. commend, exonerate, liberate, free, accuse, release, let go, pardon, blame. Amy, meanwhile, had come in and heard this last sentence. I hope she will always - always -" The sentence was hard to finish. scantiness, Saint Dominic, sandiness, ski conditions, sundanese, santims, smoothness, sentiency, Six Nations, Saint Denis, snootiness, shantung, sayan mountains, Saint Athanasius, scantness, sending, Sam Adams, squinting, sounding, Santo Domingo, soundness, sun dance, send a message, saint nick, something, smuttiness, sentience, Saint Thomas. declaratory sentence, declarative sentence, complex sentence, interrogative sentence, interrogative, run-on sentence, compound sentence, interrogation, simple sentence, question, topic sentence. string of words, word string, linguistic string.